The second restoration for the Retro Afrika Collection Project has two thugs hide a stash of diamonds in the wilderness, where only two teenage boys can find them on their lucky day. Part of a new project, the RETRO AFRIKA COLLECTION, is comprised of digitally-remastered classic Apartheid-era films, produced by and starring native South Africans. It pays homage to Hollywood action in groundbreaking B-movie style, a precursor to today’s burgeoning Nollywood industry. 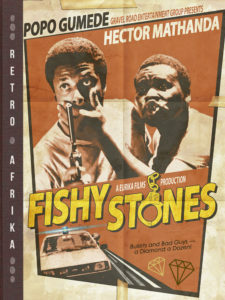 In FISHY STONES, a poorly-executed jewelry store heist finds two amateur thugs on the run from the cops. After a chase through the countryside, they desperately stash their loot in a clump of bushes, before they’re apprehended and thrown in jail. Fast forward to two teenage boys, the best of friends, heading off into the wilderness and finding a bounty of hidden diamonds on their camping expedition! Meanwhile, the two thugs make a daring escape from prison and, in a desperate search for their loot, pick up the trail of the two boys… who might need some saving.